Help! Repasted 2013 rMBP and now I can't read CPU temps. Discussion in 'MacBook Pro' started by Wickedness, Dec 20, 2014. Long time reader, first time poster. I like to tinker, and I replaced the stock thermal paste in my late 2013 13" rMBP with Arctic Silver 5. I followed the procedure at ifixit (https://www.ifixit.com/Guide/MacBoo...Display+Late+2013+Heat+Sink+Replacement/27212) using the tools they recommend. Unfortunately, after I completed the procedure, all of the temperature/fan control programs that I use stopped functioning. Macs Fan Control and XRG simply report one temperature and never update. I tried to do an SMC reset by holding shift+control+option and pressing the power button, but no dice; nothing happened. More info: SMC Fan Control has the same behavior as Macs Fan Control and XRG i.e. it often gets "stuck" reporting one past temperature and fan speed. *Sometimes* it works ok, but there's no clear pattern. My OS is 10.10.1. Is there a chance that I damaged my sensors during the paste replacement? The only tools that touched the CPU were my spudger and lint free cloth. I used Arctic Silver Articlean solution to remove the old thermal paste. Below are pictures of my work. Your sensor(s) are probably disconnected or you broke them in the process of repasting. Apart from taking everything back apart and making sure all connections are correct, there isn't much you can do. 1. Where would the connections be if I were to take everything back apart? Google & iFixit search haven't yielded any answers. 2. What usually happens is that *all* sensor and fan readings from all locations get "stuck," as described. Is there maybe a single sensor connector that came loose? I like to tinker, Any ideas? Yeah. Don't tinker with stuff you don't understand. I would take it apart and make sure all connectors are pressed into place (assuming they're the flat/snap-in types). Also thats still too much AS5 thermal paste. You only need a thin film. Most modern cpus have their thermal sensor built right into the die. So it is most likely to be your case here and I'm not aware if Apple has put additional sensor to read the cpu temperature. If there's one it's most like on the thermal pipe themselves or somewhere that the sensors can come into contact with. However I'm not sure what to make off your problem here as I've never encounter anything like that before. Hope this helps! Pointless to have done this in the first place. If it were me I would backup and do a fresh install and see if that solves anything. It's said that you can get a couple of degrees cooler with a good thermal paste. That said, IMHO it's not worth it. On a PC sure it's easy, but Macs are not tinker's toys. At the expense of any warranty I'd assume. is the battery on the retina split in 6 pieces? wow. 1. When I do something that pushes the CPU to high load, Macs Fan Control readings update regularly, and my fan ramps up speed under automatic system control. See screenshot below in which I wrote a simple program that pushes all 4 threads of my dual core Haswell i5 to close to full load. 2. 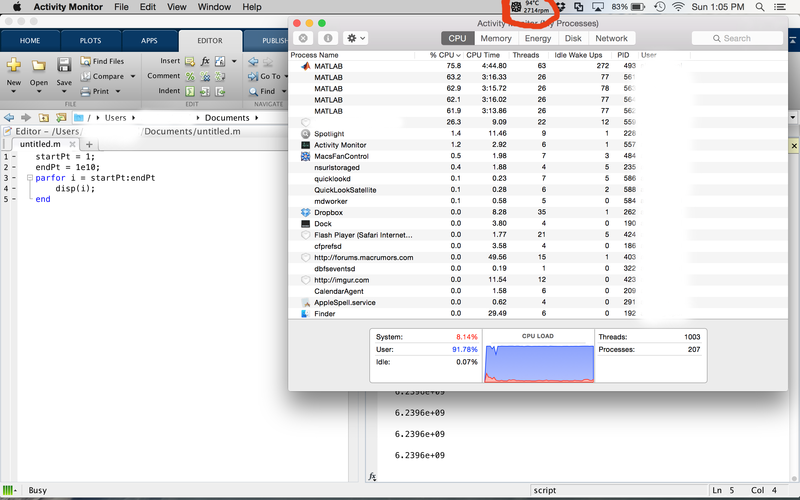 When I manually set a desired fan speed in Macs Fan Control or other programs, correct behavior appears to resume like in #1. This might be the right answer because this is starting to look like a software issue. I'll post results when I have the chance. Modern Mac`s have numerous temperature sensors and typical behaviour of a hardware sensor failure is fans running at max. I would fully remove all temperature monitoring apps to avoid any conflict. Run the Notebook on battery for a while then reconnect the power and try SMC reset again. As for repasting unlikely to make significant difference, with a modern Mac portable. Yes Mac`s portables do run hot` equally thats more to do with their thermal envelope and Apple preference for quiet operation. Apple made significant improvements with the "Retina" MBP with the introduction of a vastly improved cooling system. Ultimately it`s a personal choice, both of my Retina`s run cool, especially the new 2.8, 512, 13" so I have no inclination to break out the tools. Best recourse is to fully test your systems, not only for idle and maximum temperature, also throttling. If the system does not throttle, then there is little reason to re-paste the CPU as your not going to achieve any performance benefits. Will it run cooler? Looking across the forum it`s a "mixed bag" some have success, some don't. May be worth it if your Mac runs hotter than average, equally if not your likely wasting your time and effort. You don't have conductive paste past the die surface, while the original install certainly did. Why? Because you're smarter than Apple's engineers? How do you know the extra conductive paste isn't needed to complete the circuit for the sensor? Academic as the Apple paste use is thermally conductive not electrically, some thermal compounds are electrically conductive and need greater care on application. it was still stock paste until today, never had a glitch with this macbook pro although i do know alot of people had issues with radeon gate GPU failure. The only reason i changed the stock paste was i changed the battery and saw lots of dust and fluff inside. so decided to give the macbook a clean, ended up taking logic board out to clean properly and while i had it out also decided to check the thermal paste applied from new. The thermal paste applied from new was a mess, and had also gone kinda hard with age. so i cleaned all with alcohol and then applied cool laboratory liquid ultra liquid metal, which is really thin and runny and conductive. SO BE CAREFUL IF YOU USE THE LIQUID ULTRA AND DONT GET ANY ON PINS OR TRACKS SURROUNDING THE CPU OR GPU OR IT WILL KILL YOUR LOGIC BOARD!!!!!!! dam good stuff, but also showed how poor the original thermal paste was from apple. I guess i never gamed or did video on my macbook pro so it never really got hot enough to crack solder joints or anything. but one things for sure its a cooler macbook pro now. The reason to re apply thermal paste is easy to see when you see how poorly its applied at the factory, i spent best part of 20 mins making sure all was clean and applied properly, at the factory i would think they get 30 seconds to do the same thing so if you are a little technical minded and don't mind taking your macbook pro apart, then i would recommend you do re apply new thermal paste over the stock rubbish apple use. this only applies to people who want to keep there macbook pro's past apple care time periods. Apple for what they charge for there so called premium products should at least use a good thermal paste! Long time reader, first time poster. I like to tinker, and I replaced the stock thermal paste in my late 2013 13" rMBP with Arctic Silver 5. I followed the procedure at ifixit (https://www.ifixit.com/Guide/MacBook...lacement/27212) using the tools they recommend. Unfortunately, after I completed the procedure, all of the temperature/fan control programs that I use stopped functioning. Macs Fan Control and XRG simply report one temperature and never update. I tried to do an SMC reset by holding shift+control+option and pressing the power button, but no dice; nothing happened. I would take your macbook apart once again, and recheck all connections and re install OS X and go from there. hope it works out for you. good luck there! 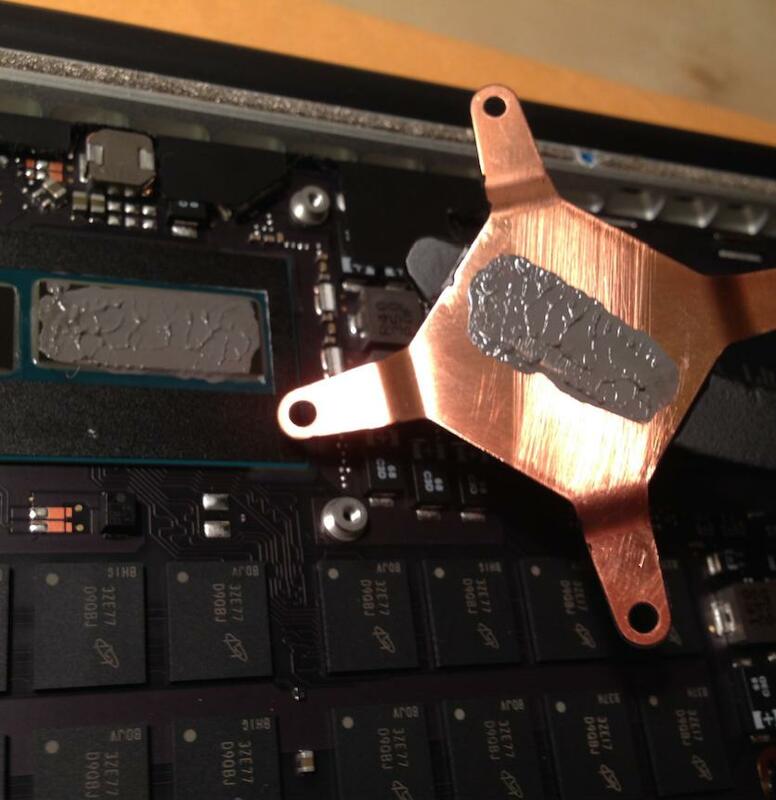 This is what I call "Apple assumerists"
Don't use liquid metal thermal paste. It'll quickly diffuse into the copper heatsink base and won't last much more than 1 year. LM can also damage your die surface + is a PITA to remove. When I did my tests, LM was only 2-3C better than properly applied MX-4, and required extra tape to insulate all SMD components around the CPU/GPU die. As a result of my LM experiment after 1.5 years it ruined my heatsink and left a few microcracks on the die surface after several hours of careful removal process. During the last month LM performance quickly degraded to the point of eternal throttling (so approximately 30-40C above stock temps under comparable load). Looks like way too much paste. Its supposed to be as thin a layer as possible. I usually spead with a razor blade and wipe the excess. You should've tried a clean install (even on another drive) before starting the thread IMO. I think it's just a coincidence and the repaste itself didn't change anything. Maybe you installed/updated some software and the power off/on cycle for the repaste was the first actual restart after the installation? No it's not, it looks like you're repeating the common mantra without understanding how that really works. In a few words, it's much harder to prevent air bubbles with thin TI layer, especially if you spread it manually with razor blade (it's something you shouldn't do at all). The amount of TI in that picture is fine and excessive paste will be pushed away during the contact. If you're concerned with TI being too viscous during initial application I'd recommend to warm it up in a hot waterbath. You also should never apply very small amount of paste unless you're certain that heatsink is 100% flat. I have run a water cooled gaming machine at 4.6g hex core with laboratory pro liquid ultra for 2.5 years with no issues at all.used on NV video cards also with no issues. i don't know what liquid metal you used but the only thing it shouldn't be used on is aluminium heat sinks. the load temps on said gaming machine have never changed since day 1. its the best thermal compound period. but if you don't wanna use it, anyone is free to use what they like, the whole point is stock thermal paste application is very poor. And Apple's application isn't that poor. All the excessive thermal paste is being pushed away, which doesn't affect temps. I'm more concerned with the paste quality. As I said before numerous times, TI overapplication impact is hugely overrated. Op I've not read the whole thread but 2 things. 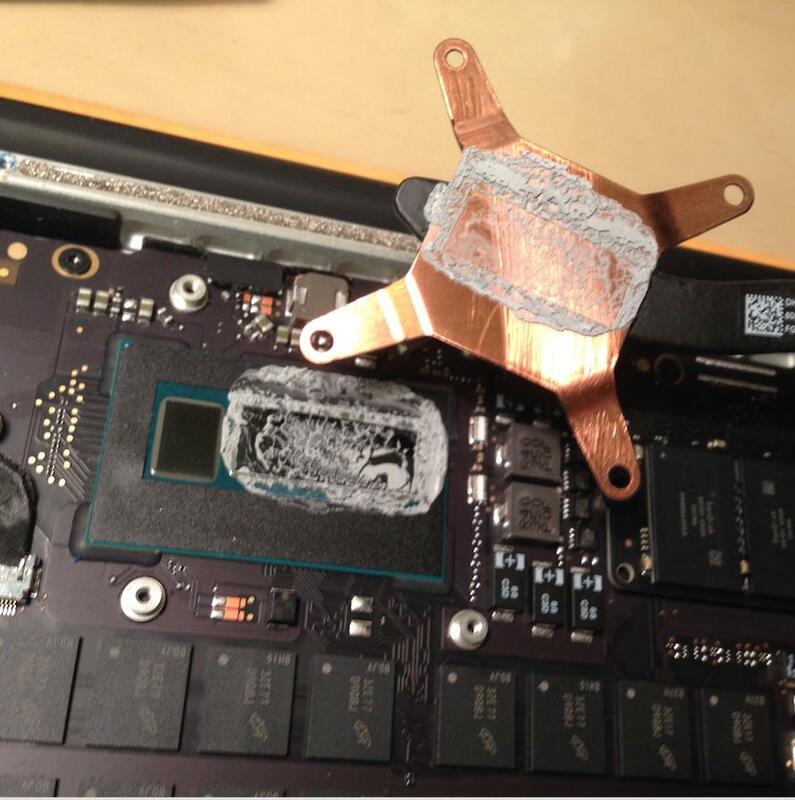 1 you've applied way to much thermal compound. 2 have you tried creating a new account on your Mac and seeing if the issue persists. Well i am not sure why you experinced it eating into your rmbp heatsinks, unless the copper used wasn't the best quality or you had some fake CLU liquid metal, and yea there was some fake stuff going around. It is supposed to dry out and leave a solder like finish when it does. I have upgraded GFX cards and returned the standard coolers on the cards and inspected the die surfaces for damage and heatsinks after removal, and the GTX 680 sli setup was well over a year old close to 2 years before the 980's replaced them. not one 680gtx showed any sign of pitting or damage on the heatsink or die. and ran the same temps for 2 years from day one. the hex core CPU is still in that machine and again the temps have not changed. i will keep an eye on the macbook pro temps but so far all I've seen is a great improvement over the stock thermal paste used. and i have to disagree with the quantity of paste being used as making little difference. all that Ouse's out the sides of the heat sink and sits on the CPU or GPU surrounding the core itself acts as a blanket and can increase temps. application of any tim is the key to gaining better temps, having tried them all in many machines the CLU has the best thermal transfer of any I've used. 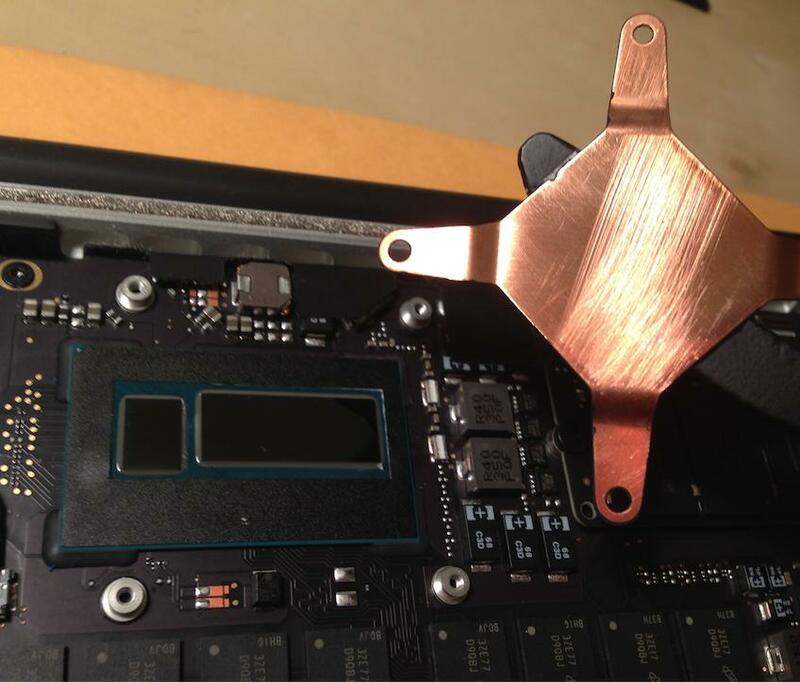 but time will tell if my macbook pro suffers from heating up after a year and damages the die and the heatsink, it can only be the poor copper quality used in the heatsinks by apple. as a good quality heatsink CLU has not touched the surface at all. can only be down to the purity of the copper used as heatsinks.